This (free) extension implements an odometer for smoothly transitioning numbers. 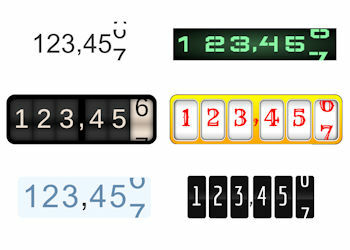 The start and end values of the counter are configurable. The Odo Meter starts when it scrolls into the viewport, and it is reset when it scrolls out of the viewport. 6 themes are included, the default theme lets you define a custom size, font and colors.